I have already written some articles about smart play tables for children but I don't think I may overinform you in this subject. I do hope my articles may help you find nice furniture for your kids so that you wouldn't have to learn from your mistakes. The children of age about 3 start spending more time at the table while making their art and craft works, and if we provide them the attractive and comfortable one, it would definitely help them to prepare better for school (where they would spend so much time at the desk). 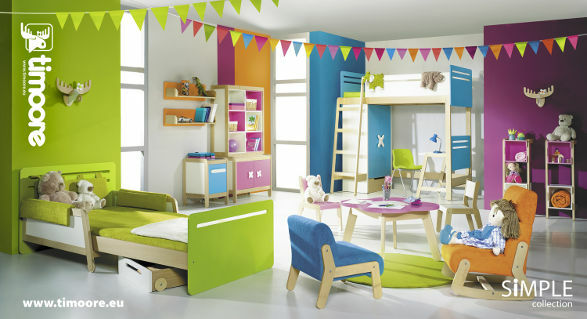 When your newborn grow up and become preschooler it is a right time for you to rearrange your child's room. The baby's needs and interests change. Either boys or girls who are 2-3 years old like pretending plays, arts & crafts and creating their space personally. And in the next few years your child would go to school and need some place for learning too. You know it is your responsibility to provide a child friendly, safe and stimulating environment. It is quite easy with good designed, which means nice looking, multifunctional and carefully finished furniture Locomoco by XYstudio. Who knows better then parents what is best for kids? Who understands better children's needs and the dangers they can face? Parents I think, are the best designers of products dedicated to children. Parents, who make use of their experiences and do not hesitate to test their concepts with their own offspring. This is how Timoore acts.